The juxtaposition of needless and almost surreal violence in what appears to be a present day city against a group of children playing a seemingly harmless game out in the country is our unsettling introduction to Shin Sekai Yori, another of my picks for the autumn season - as opening scenes go, it certainly seems to set the tone for what is to follow. As we move into the episode proper we're introduced to a world one thousand years in the future from the present day, and more specifically a girl named Saki Watanabe as she undergoes what seems to be a very important rite of passage - the blossoming of a supernatural power (conveniently known as a "Power"), which she then has supposedly sealed and presented to her once more as part of a religious ceremony before allowed to move forth to a new school and a so-called "Unified Class" - a place to hone and perfect the use of these powers. As a late bloomer, this progression means that Saki finally gets to catch up with a number of her former school-friends and classmates from elementary school; a mixed blessing in some cases, but overall a decidedly happy reunion as she goes about learning the ropes in this new establishment. 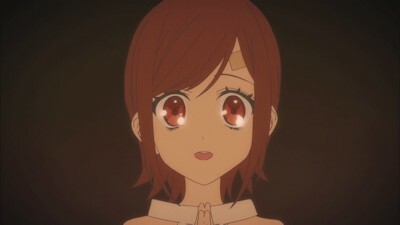 However, it seems as if Watanabe can't quite focus entirely on her future, as her mind is wracked with memories - possible sightings of an urban legend known amongst the kids as "The Trickster Cat", and overheard snatches of an argument between her parents that suggest something far more sinister is at work than mere graduation and education. With all of this to lay out, Shin Sekai Yori's opener is very much about scene-setting and world-builder - something which it tries to do with suitable panache and smart use of its colour palette, and something which is largely succeeds at. There can be little doubt that we've been planting into an intriguing world by this series, with supernatural elements on the one hand and conspiratorial murmurings on the other - until we get a feel for how those two concepts mesh together into a coherent story however, I'll simply say that this series looks to have plenty of potential and nothing more.